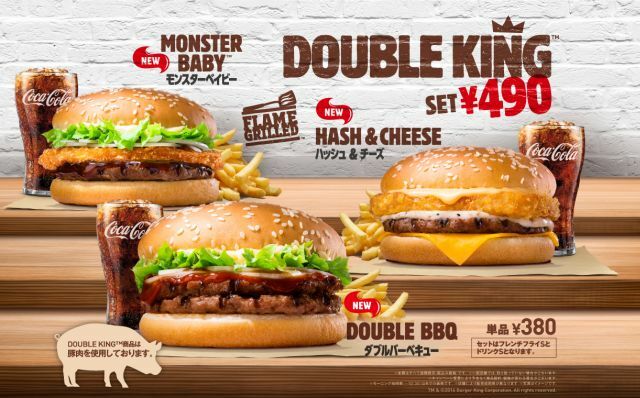 Burger King Japan is cooking up a new burger called the "Monster Baby" as part of a new line of Double King burgers. The name seems to be in reference of the odd combination of a flame-grilled pork patty and spicy crispy-fried chicken patty to go along with mayo, teriyaki sauce, lettuce, and onions. Also featured on the Double King menu are the Double BBQ and Hash & Cheese. As the names suggests, the Double BBQ features double pork patties and barbecue sauce, while the Hash & Cheese features a pork patty and hash brown along with two cheeses and Caesar dressing. 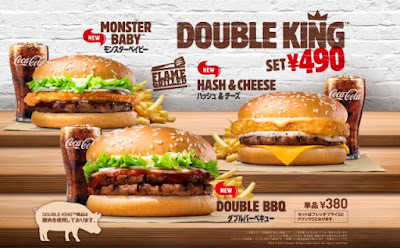 Image via Burger King Japan.